Looking for homes or real estate property for sale in Burlington's Lowville area and the surrounding neighbourhoods: Cedar Springs, Alton, Nelson and Kilbride? You have come to the right place! Here you will find photos and detailed descriptions of our currently active Lowville homes available for sale. Additionally there is some helpful information about Lowville area intended to help you familiarize with the neighbourhood. If you are interested in a particular Lowville MLS listing, be sure to contact me. As a professional REALTOR® with 23+ years experience I am very familiar with the Lowville area of Burlington and I will work tirelessly on your behalf to find you a perfect home in Lowville that's just right for you! Sorry! There are no Houses for Sale in Lowville Ontario posted on this website at this time. Please return to our main listings page and try another search. Or would you like to be notified when properties become available that match your search? As a long time resident of Burlington, Lori VanDinther - Burlington RE/MAX® Real Estate Agent, will work hard to help you find and buy a house or real estate property in Lowville area and the neighbouring Cedar Springs, Alton, Nelson and Kilbride areas. Lori has been successfully selling real estate property in Burlington's Lowville area and the surrounding neighbourhoods of Cedar Springs, Alton, Nelson and Kilbride for 23+ years! Burlington is one of the best places to work and live in Canada! It's one of the safest communities to raise a family or run a business. If you are looking for houses for sale in Lowville Ontario, or thinking of selling your Lowville real estate, downsizing or perhaps relocating to another city – put the experience of a professional REALTOR® to work for you. Burlington Real Estate Agent, Lori VanDinther wants to help you Make the Right Moves! I just wanted to thank you for the professional manner which you have handled our listing. Paula and I are extremely grateful for the amount of effort and the extra mile you have gone to meet our extremely hi standards and expectations and for the first time in selling our many houses that we have owned. We think you have been by far the best Burlington Real Estate Agent, thank you! I would further like to add that your office staff has been above exemplary. Dianna and Anita deserve special mention!! Lowville is a quaint little village community located along Guelph Line, six miles north of Dundas St. (Hwy #5) in North Burlington. The village of Lowville was settled by the Reverend Daniel Pickett and his family. Pickett was an early Methodist circuit preacher, who was born in New Milford, Connecticut in 1774. Lowville is Burlington's secret gem as it runs along Bronte Creek. 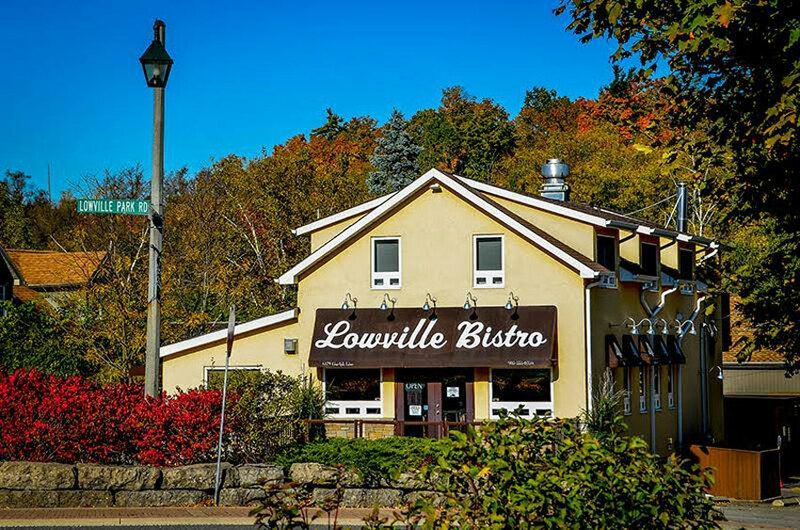 The community is situated around Lowville Golf Club and The Lowville Bistro, an amazing upscale casual dining place. Homes in Lowville vary, some are old with huge lots and mature trees, others are large modern villas. Home prices start at $540K and go up depending on the size of the property. Lowville area is within easy driving distance of Hamilton, downtown Burlington, Oakville, Mississauga and Toronto via the 407, 401 and QEW. If you're looking for a quiet, family cottage style type of living then Lowville is perfect for you.